The inn was built in the C18 or earlier. Thomas George (b. Ffynnoncoronau, Bridell, son of John George) and family moved here ca. 1859. In 1859-70 Thomas George was the publican. On 27th October 1860 John Picton George, son of Thomas & Mary George of the ‘Pendre Inn’, was baptised at Bridell Church. In 1861 the following persons lived here: Thomas George, 32, maltster; Mary George, 27, his wife; David George, 3, their son; John George, 1, son; Rachel Davies, 24, house servant; and Rachel Thomas, 16. In 1862 Thomas George became a trustee of the new Penuel Baptist Chapel in the village. In June 1862 Mary Anne George, daughter of Thomas & Mary George, was born here. On 4th February 1863 Mary Anne George, daughter of Thomas & Mary George of ‘Pendre Inn’, was baptised at Bridell Church. On 9th March 1863 Mary Anne George, daughter of Thomas & Mary George, died aged 1. On 4th May 1864 William George, son of Thomas & Mary George of the ‘Pendre Inn’, was baptised at Bridell Church, having been born on 4th April 1864. Ca. 1868 Elizabeth “Betsey” George was born here, daughter of Thomas & Mary George. Thomas George died on 10th January 1870, aged 41. In 1870-78 Mary George was the publican. In 1871 the following persons lived here: Mary George, 38, widow, maltster & publican; David George, 13, her son, maltster; John George, 10, son; William George, 7, son; Elizabeth George, 3, daughter; Mary Anne Mathias, 19, servant; and Mary James, 17, servant. Mary George’s son, John Picton George, aged 18, drowned on 14th September 1877 when a fishing boat capsized on Cardigan Bar. On 21st December 1878 Mary George was buried at Bridell Church, having died here aged 46. Her heir was her son, David George. In 1878-85 David Morris George (b. 1857 Manordeifi, son of Thomas George, originally of Ffynnon Coronau, Bridell and Mary George nee’ Morris) was the publican. In March 1880 he married Mary Anne Jones. On 22nd November 1880 a daughter, Betsey George, was born to the wife of David Morris George, maltster. In March 1881 Thomas William George was born here. In 1881 the following persons lived here: David Morris George, 23, licensed victualler (b. Manordeifi); Mary Anne George, 22, his wife; William George, 17, his brother; Betsey George, 13 months, daughter; and Thomas William George, 4 months, son. Except where noted otherwise, all were born in Cilgerran. In September 1882 Mary George was born here, daughter of David Morris George & Mary Ann George. In June 1884 Martha George was born here, daughter of David Morris George & Mary Anne George. On 19th August 1885 David Morris George died suddenly aged 28. In 1885-1933 Mrs. Mary Anne Gerge was the publican. In 1891 the following persons lived here: Mary Ann George, 31, widow, inn-keeper; Thomas George, 10, her son; Mary George, 9, her daughter; Martha George, 7, daughter; William George, 27, brother-in-law; Betsy George, 24, sister-in-law; and Hannah John, 26, servant. In 1891-1902 William George lived here. In March 1892 Mary Anne George married her brother-in-law William George. In September 1892 Betsy George was born here, the daughter of William & Mary Anne George nee’ Jones. 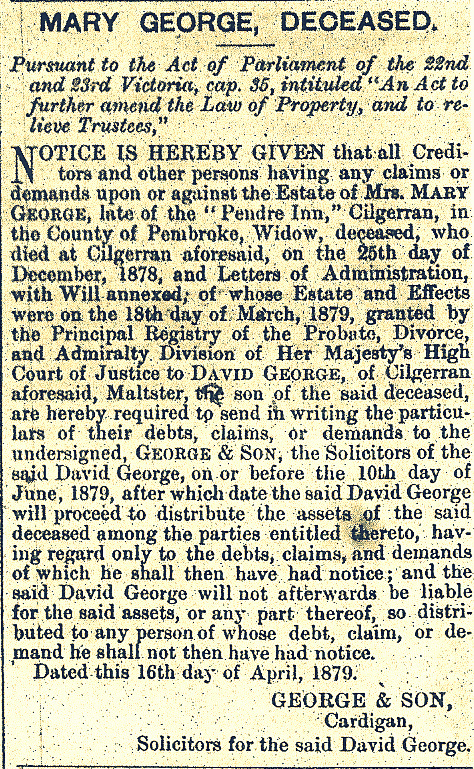 On 26th January 1893 Betsy George of the ‘Pendre Inn’ married David Thomas of Pendre, joiner. In 1894 the old Court Leet was held here for the last time. In June 1894 John Morgan George was born here to William & Mary Anne George. On 8th October 1896 Rhoda George was born, the daughter of William & Mary Anne George. On 16th October 1896 Rhoda George of ‘Pendre Inn’ was buried at Bridell Church having died on 14th October 1896 aged just five days. On 2nd February 1898 Nellie George was born. On 31st January 1900 Nellie or Hettie George of the ‘Pendre Inn’ was buried at Bridell Church, having died aged 2 on 27th January. In 1901 the following persons lived here: William George, 36, maltster & merchant; Mary Anne George, 40, his wife; Thomas H. George, 20, his step-son; Mary George, 18, step-daughter; Martha George, 16, step-daughter; Betsy George, 8, daughter; and John Morgan George, 6, son. All were born in the parish and bilingual. The pub appears in a postcard of c1910, at which date part of the roof was tin, older roof dormers were visible and there was no porch. On 2nd September 1912 William George of the ‘Pendre Inn’ was buried at Bridell Church, having died on 28th August aged 48. On 5th May 1913 Dan Thomas married Miss Mary George, eldest daughter of Mr. & Mrs. George, ‘Pendre Inn’. On 10th April 1917 Miss Martha George of ‘Pendre Inn’ married Isiah Thomas of Llanelli. On 4th July 1921 Mrs. Mary George Thomas, wife of Daniel J. Thomas of the ‘Comercial Hotel’, Pendre, Cardigan, died. She was the daughter of Mrs. George of the ‘Pendre Inn’. On 17th January 1922 Bessie George of Pendre married John Davies of Heolgwyddil, Ferwig. 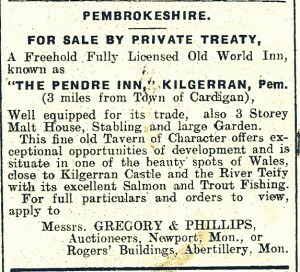 In July 1930 the inn was advertised for sale. In July 1932 Mrs. George advertised the inn for sale or let. In 1933 Mrs. Mary Ann George, landlady, retired and left the inn. In 1933-36 Mrs. Beynon, publican, lived here. 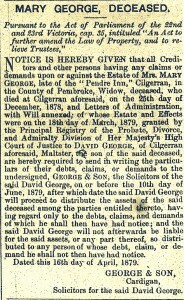 On 26th February 1934 former landlady Mrs Mary Ann George, widow of William George, died aged 76. 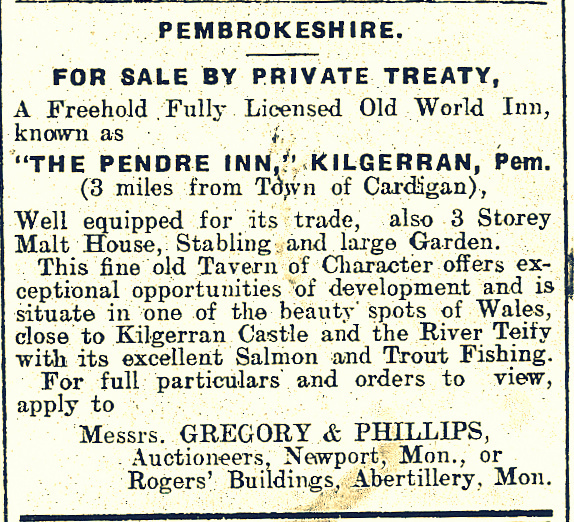 In February 1935 the ‘Pendre Inn’ was sold to Miss M. Thomas, Y Bryn. On 25th March 1935 it was advertised to let. In October 1936 Ethel Elizabeth Beynon was the licensee. In 1937-46 Elsie Sandalls was the publican. The pub was referred for compensation in March 1937 and March 1938, but remained open. In 1940 Miss Mary Thomas lived here. In 1940-46 Elsie Sandalls’ brother William Sandalls worked here. In December 1944 and February 1945 the property was offered for sale. It was sold in August 1945. On 16th March 1947 the roof was blown off in a gale. Reginald Popplewell became the licensee that year until 1968. In January 1968 the inn was sold. In 1970 Moira & John Percival were the landlords. On 18th September 1970 it was noted that Mrs. Marjorie Andrew of Bosworth was the new publican. The building was listed in 1994. Renovations were conducted here in 2000. “…EXTERIOR – C18 inn, possibly earlier, whitewashed rubble stone with imitation slate roof and brick stacks. One and a half storeys. L-plan with projecting gable to right, brick end stacks and ridge stack and W end lean-to. Gable has 12-pane sash each floor with timber lintel and hornless sash to lower window and stone voussoirs and horned sash above. To left, painted brick porch and 12-pane sash to ground floor, projecting slate shelf course at lintel level, and first floor pair of 12-pane sashes breaking eaves under flat dormer. E end service range with brick E stack, slightly lower roof line and 12-pane sash over large casement pair with timber lintel. Outshut rear to main part. 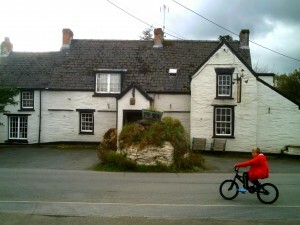 I was intrigued to come across your site when doing a search, on a whimsy, about the Pendre Inn in Cilgerran. Your site is a very interesting and, I think, valuable resource for the history of the area. For me, though, it recalls personal reminiscences which may or may not be of interest to you. My sister (who is somewhat older than I) lived in Cilgerran with her husband in the later 1940s. He was employed in military research (development of missiles, I believe) being done somewhere in the area. My mother and I would come to stay with them during the summer school holiday and when, on one occasion, my mother fell ill, we stayed on while she recovered and during this time I attended the village school. My sister and her husband lived in a house called Dychwelfa. I see there is a Dychwelfa at no. 2 the High Street but do not think this is the same house. My sister’s house was next to a chapel, the Babell C.M., I believe, just to the right of it, looking from the street. The house and the one next to it shared the back garden and both belonged to the baker from whom they rented their property. I remember going into the bakery and seeing the big oven. There was no sewerage and the toilet in my sister’s house was an Elsan which was periodically emptied into a hole in the garden. At the end of the garden were a pair of small pigstyes, happily untenanted. Both Welsh and English were spoken in the village and my sister claimed that if she went into a shop, shopkeeper and customers would switch to Welsh so as not to be understood by her. There certainly seemed to be, if not hostility, at least an attitude of stand-offishness towards the English. I experienced something of this myself from school pupils (see below). On a recent visit to the area, we visited the castle but in the days of which I speak, it was closed to the public. We sometimes went down to the Teifi and walked along the bank where I would play ducks and drakes with pieces of the plentiful slate spoil. There were also a number of ruined or perhaps unfinished buildings at various points. I was told that this was because there was a bye-law stating that if someone could build a house in 24 hours, they could own the stretch of river bank which it commanded. I don’t know whether there is any truth in this or whether it was an ‘urban myth’. People still fished the Teifi in coracles that they made themselves and could be seen at evening returning home, carrying their coracles on their backs, looking like giant beetles. My sister and her husband were on friendly terms with Mr Popplewell, the landlord of the Pendre Inn. I never went there myself (being too young) but my sister and her husband spent many an evening there. I think the Popplewells were an English couple and that they kept a pig or pigs in the pub grounds. I normally attended a council school at home and was highly critical of the village school. I don’t remember the name of the headmaster but our class teacher was a pleasant man called Mr Griffiths. There was only ad hoc division of pupils into classes and we were often taught together. Teaching seemed a very desultory affair and barely organized. At break, boys and girls went out into separate playgrounds and I remember the boys playing at throwing knives at the wooden fence. One clipped the top of the fence and continued into the girls’ playground. Fortunately, no one was hurt. There was another English pupil, a girl, at the school and we were treated by the other pupils as a pair of oddities. In one class, the teacher got me to read aloud and waxed lyrical over my way of pronouncing ‘o’ (as in ‘pope’). This attention did nothing to endear me to my classmates. Every year, I would find a caterpillar of a garden tiger moth and keep it in a jar until it mutated into the adult form and then release it. On this occasion, we had departed for Wales before the final stage, and so I took my tiger moth caterpillar with me. The adult emerged while we were in Cilgerran. Hearing of this, Mr Griffiths bade me bring the jar to school and examined it with interest. I think he had ideas of using it to teach the children something. Unfortunately, they demonstrated a level of ignorance about nature that was hard to undo. I have written this as a comment because, though you invite contact, you provide no email address. (May I suggest that you add one to the site?) Feel free to delete it if it is of no interest or you want to use it in some other way. PS Where, following the reference to Mr Popplewell, you say ‘In January 1948 the inn was sold’, perhaps you mean 1968.